Boeing values the personal and professional growth of its people. That's why the company offers its people educational resources such as the Learning Together program, in which Boeing pays for tuition and many related expenses for employees enrolled in courses from accredited colleges, universities or trade schools. Boeing's industry-leading support for employee training and education is a legacy that goes back to the company's Articles of Incorporation. Company founder William Boeing included in the Articles this forward-looking provision: "To maintain, carry on and operate schools of aviation, and for the teaching of all branches of knowledge and of the arts and sciences in any way connected with or useful for the operation of aeroplanes and other vehicles of aviation." Early on, Bill Boeing proved his support of education and training by working with the University of Washington to establish an aeronautical engineering program, which at that time was only the second of its kind in the United States. To help start the program, he provided the university with a wind tunnel-only the third major tunnel in the country and the first west of the Mississippi River. A decade later Boeing went a step further by building an entire school dedicated to training pilots, mechanics and other personnel specifically for Boeing Air Transport, the airline subsidiary of the Boeing Airplane Company. The company chose a site at the Oakland Municipal Airport in California, the largest municipal airport in the United States at that time. The Boeing School of Aeronautics opened on Sept. 16, 1929, under the direction of BAT Pilot Theophilus Lee Jr. The school was set up to train about 35 students annually. When it opened, 100 students immediately applied. To accommodate the demand, the school quickly expanded and started classes every three months instead of every year. In 1929, Bill Boeing merged his airplane company and BAT with Pratt & Whitney to form United Aircraft and Transport Corporation. The school benefited greatly from being a part of UATC: The school's Engine Lab always had a supply of Pratt and Whitney engines, and the pilot training operations had an impressive fleet of aircraft. Five years later, UATC broke up. 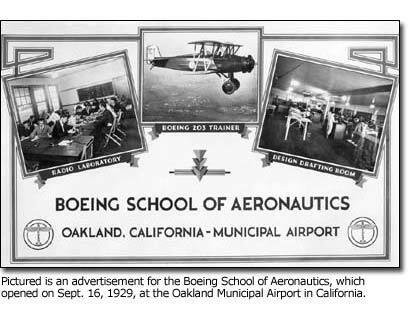 As part of the reorganization, United Air Lines acquired The Boeing School of Aeronautics in late 1934. Despite the Depression, the school expanded and attracted new students. It grew from 100 students managed by a staff of 16 in 1929 to nearly 500 students and a staff of 41 in 1937. In the fall quarter of that year, the school introduced a new program called the Practical Aeronautical Engineer's Course. It not only included thorough technical training but also practical training to familiarize students with the construction of an airplane and its parts. In 1940, the school began shifting to military training after getting a contract from the U.S. Army Air Corps to train mechanics. In August 1942, to support the Army training program, the facility added 14 new buildings, giving it the capacity for 1,095 trainees. About 5,000 mechanics were trained through the duration of the contract, which ended in August 1943. On Jan. 8, 1943, the name of the school was discontinued and its accounts were consolidated with other parts of United. The Boeing School of Aeronautics was officially closed. In recognition of the school's facilities transitioning completely to military training, the name of the former Boeing School of Aeronautics was changed to United Air Lines Training Center. When military training ended in 1945, the training center was closed. 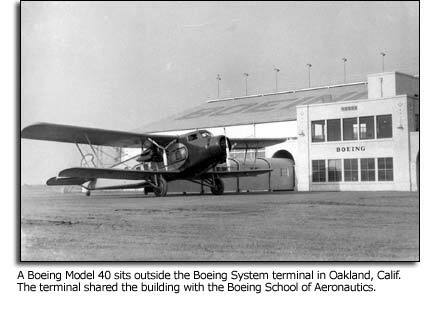 Today, one can still visit the site of the former school at the Oakland Western Aerospace Museum, housed in one of the school's hangars built during the 1940 expansion.